We love turning our recycled toilet paper rolls into crafts. It makes for a very inexpensive craft project! This Christmas season so far, we have used toilet paper rolls to make a toilet paper roll reindeer and now we are transforming them into a Christmas Tree Craft. 1. Cut each toilet paper roll in 1/2 longwise, so you have 4 equal sized pieces. 2. Leave one piece as is. Holding the pieces horizontal, cut a little off each of of the other 3 pieces, cutting a little more as you progress through the pieces. The idea is that when you lay them down, they progressively get shorter to the top of the tree. 3. Take the piece you cut off the last piece and use it for your tree stump. 4. Lay all the pieces out to form a tree. Use a hot glue gun to attach them. I had to mold them a little once the glue was dry. 5. Paint the tree green and the stem brown and allow to dry. 6. Once dry, take q-tips and paint lights on the tree with various colors of paint. 7. If you want to make this into an ornament, make a loop with a piece of string or twine and glue the ends to the back of the top of the tree forming a hook to hang it from the tree. I did this craft with my preschooler. I did the cutting and gluing and she did the painting for her tree. These are cute project, I have so many toilet rolls waiting to be crafted. This is a great Christmas craft idea. My kids loved making this craft! We loved that you shared the picture of the tree your preschooler made! It’s nice to see the “real” final product. Thanks for this great idea Kim! 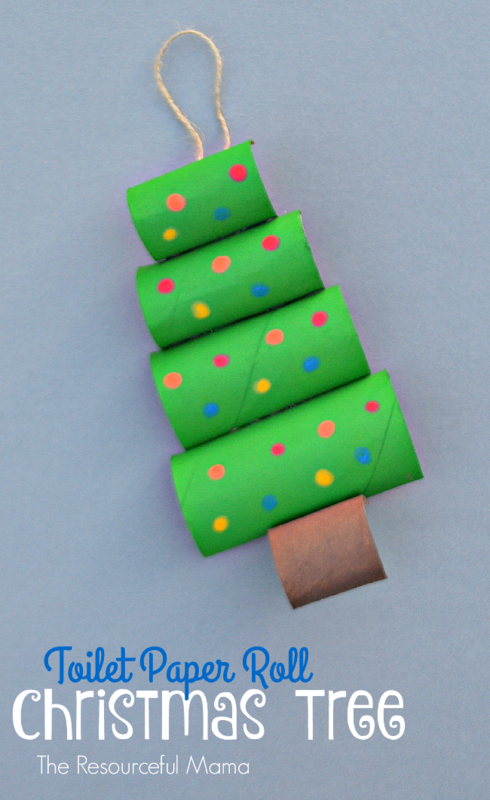 My daughter and I had so much fun creating our Toilet Paper Roll Christmas Tree! We decided to decorate our tree by gluing on some of our colorful puffs (poms) and it turned out great! You are welcome Stacey! So glad you enjoyed it and love the idea of using colorful poms! Great craft for little fingers. I made these with my 2 1/2 year old daughter. We added glitter for tinsel and pom poms for baubles. We’ve made more for grandparents and aunty and uncle too! Love the addition of glitter and pom poms!